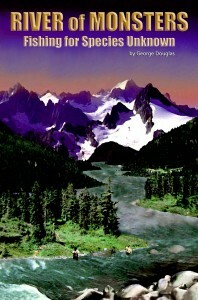 The winner of our April/May giveaway, George Douglas’ book River of Monsters, is Ehren of Montana. Congratulations! To see our book review, click here. Imagine the opportunity to catch the fish of a lifetime, the offspring of a sabertooth salmon that swam the earth’s rivers 11 million years ago. The government will outfit your expedition and pay you a handsome sum to do it. And you can bring along your favorite fishing buddy. Not a bad way to earn a living. So begins the new story from George Douglas, River of Monsters. The book’s 124 pages follows the fishing exploits of fly fishing expert Jeff Warner and his friend Rick Porter as they chase the a special strain of salmon spawned from prehistoric eggs. These fish are big, aggressive, and have a glowing red stripe that runs from the tail to the adipose fin. They exist in the Talon River in British Columbia, in a stretch of river that contains class 3, 4, and 5 rapids. Although the government will pay Jeff to verify the existence of this fish, they’ll pay even more if he brings one back alive. 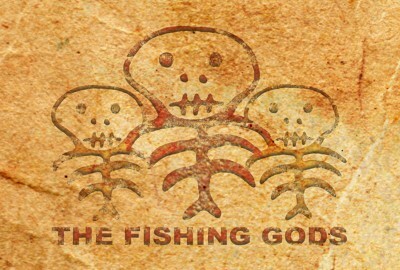 If you ‘re looking for a quick read that mixes adventure fly fishing with a little sci-fi, then this book is for you. This book was written with teens and young adults in mind, so it would make a great summer reader as well. George was kind enough to provide an extra copy, so for our April/May giveaway, we’re offering River of Monsters to one lucky winner who signs up for our email list between now and May 31st. If you don’t want to wait, you can order your own copy here. We have a winner for our November Contest. Jaclyn of North Carolina won a Copy of George Douglas’ Fish Like a Guide. Congratulations Jaclyn! For December, we are giving away a copy of the DVD Rivers of a Lost Coast to one lucky winner. If you have not already signed up for our email list, please do so to be entered into our December contest. A review of this DVD and contest rules are coming soon. When George Douglas sent me a copy of his latest book, Fish Like A Guide, I didn’t know what to expect. I had seen George speak a couple of weeks ago and enjoyed his presentation, but outside of Kype Magazine, I wasn’t familar with his approach to fly fishing or guiding. I’m happy to say that I found the the book to be insightful, educational and enjoyable. The back cover says that the book “reveals the strategy and advance thought process that provides anglers with a road map to success.” I would agree with this statement, but would add that George provides just as much common sense to his approach to both fly fishing and guiding. George addresses everything from trip preparation to gauging the impact of weather and water conditions. 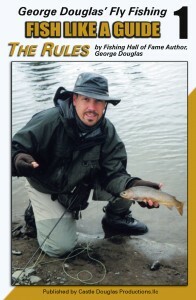 He also shares the personal rules that have led to his fly fishing success. 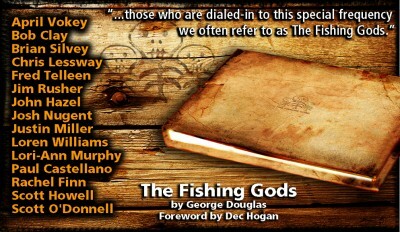 For those looking for a practical guide to fly fishing this is a great resource and an easy read. I enjoyed the book so much that I’m giving away a signed copy to one lucky winner as part of FinFollower’s November email sign up campaign. Everyone joining our email list between October 23, 2010 and December 1, 2010 has a chance to win this great book. Contest rules appear below. If you don’t want to wait, and want to purchase Fish Like A Guide now, go to this link. I look forward to seeing more from George and giving away a copy of Fish Like A Guide soon. Conrest rules appear below. Enjoy! All legal U.S. residents residing in the 50 United States and the District of Columbia who are 18 years or older at the closing date of the contest may participate in this contest. By entering a contest on Finfollower.com, you represent that you are either at least 18 years of age. Employees of Finfollower.com, their immediate families and members of their households are not eligible to participate in contests. By registering to win the prize, the winner grants Finfollower.com permission to use his/her name (including screen name) and likeness for advertising and future promotion purposes without additional compensation (except where prohibited by law). Unaccepted prizes may not be awarded at our discretion. To enter a contest on Finfollower.com, follow the contest entry instructions as described in the contest announcement. Finfollower.com is not responsible for errors, omissions, interruptions, deletions, defects in part or whole, delays in operations or transmission, theft or destruction or unauthorized access to or alterations of entry materials, or for any technical or non-technical network, telephonic, electronic, computer, hardware or software malfunctions of any kind, or inaccurate or partial transmission of or failure to receive entry information by Finfollower.com on account of technical problems or traffic congestion on the Internet, at any web site or any combination thereof. Finfollower.com is not responsible for any injury or damage to entrants or any other person’s computer related to or resulting from playing or downloading any materials in the contest, or for mail-in entries that are lost, late, misdirected, damaged, incomplete, altered, illegible or postage-due. All entries become Finfollower.com property and will not be returned. Finfollower.com reserves the right to cancel temporarily or permanently the electronic method of contest entries at our discretion. Your entry will be disqualified, at the sole discretion of Finfollower.com, if you attempt (i) to enter a contest through any means other than as described in these Official Rules; or (ii) to disrupt the contest, circumvent the terms and conditions of these Official Rules, or in any way tamper with the contest. If either of the above occurs, Finfollower.com reserves the right to remedy any such action, disruption, or circumvention, and to seek damages from you to the fullest extent permitted by law. By participating in any contests at Finfollower.com, you agree to release and hold Finfollower.com and its directors, officers, employees and agents, and all prize suppliers harmless from any and all losses, damages, rights, claims, and actions of any kind in connection with the contest or any product purchased, or resulting from acceptance, possession, use or misuse of any prize, including, without limitation, personal injuries, death, and property damage, and claims based on publicity rights, defamation, or invasion of privacy, whether suffered by you or a third party. Finfollower.com contests are void wherever prohibited or restricted by law and is subject to all applicable federal, state and local laws and regulations. By participating, entrants agree to be bound by these Official Rules and the decisions of Finfollower.com and waive any right to claim ambiguity in the contest or these Official Rules. All decisions regarding contests, including, but not limited to, selecting winners, will be made by Finfollower.com, whose decisions shall be final. Winners are solely responsible for all applicable federal, state and local taxes. Winners will be selected by Finfollower.com, based on criteria described in the contest entry announcement. Finfollower.com retains sole discretion over selection of winners and criteria. The winner will be notified within 30 days of the contest ending date. Finfollower.com reserves the right to modify scheduling of the contest without prior notice. If Finfollower.com determine at their sole discretion that there is any suspected or actual electronic tampering with the giveaway or if technical difficulties compromise the integrity of the giveaway, we reserve the right to void the entries at issue, and/or terminate the giveaway and conduct a random drawing to award prizes using all eligible entries received as of the termination date. Winners may be required to sign and return an affidavit of eligibility within 3 days of notification attempt. Failure to return the affidavit in the time noted will result in disqualification of the entry and the random selection of an alternate winner. Finfollower.com may require winners to provide proof that they are the authorized account holders of the e-mail addresses used to enter the contest. “Authorized account holder” is defined as the natural person who is assigned to an e-mail address by an Internet service provider, online service provider, or organization (e.g., business, educational institution, etc.) that is responsible for assigning e-mail addresses for the domain associated with the e-mail address. Any winner who does not comply with the Official Rules will be disqualified and an alternate winner will be selected. Return of any prize or prize notification as “undeliverable” will result in disqualification and an alternate winner will be selected. Prizewinners will be notified by e-mail sent to the e-mail address on the Finfollower.com account (or the e-mail address on the mail-in entry when applicable), and Finfollower.com is under no obligation to notify winners by any means other than e-mail. If a winner’s Finfollower.com profile is no longer active, notification will be sent to the last known e-mail address. If a prizewinner entered by mail, the notification will be sent to the address that was printed on the 3?x 5? piece of paper. Finfollower.com is not responsible for notifications that are misdirected or not received because of e-mail addresses or mailing addresses that are no longer correct. If a potential winner cannot be reached after a reasonable effort has been made during 3 business days from notification attempt, such person may be disqualified, with an alternate winner selected. Any prize notification or prize returned as undeliverable will result in the awarding of that prize to an alternate winner. Finfollower.com will deliver the prizes as follows: All Prizes. Each prize will be shipped to the appropriate winner’s home address, or delivered to their e-mail address when applicable (as in the case of electronic gift certificates). Prizes are non-transferable and non-assignable and no substitutions or cash equivalents are allowed except by Finfollower.com, who also reserves the right to award a prize of equal or greater value if the advertised prize is unavailable. A list of prize winners will be posted on Finfollower.com. The names, logos, and icons identifying the products and services of Finfollower.com and any other corporations listed in the contest entry page are proprietary marks of their respective owners. Contest rules are subject to change at any time without notice.